Canada is indeed a wonderful place to include in your travel bucket list. With its vibrant cities, beautiful sceneries, and welcoming atmosphere, you can assure that your next travel will be a fun-filled and satisfying experience. In Canada, you can have a fun adventure in the country’s great outdoors, visit a protected wilderness area, feast your eyes on majestic waterfalls, or experience the beautiful culture that the country has to offer. So if you’re looking for a travel-worthy place to visit, Canada is the best way to go. 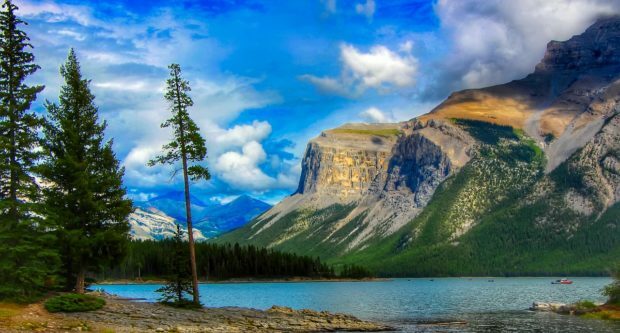 Here are the seven tourist spots in Canada that are sure to hype up your wanderlust. If you love to explore the mysteries of the past, then the Kay-Nah-Chi-Wah-Nung Historical Center is the ideal place for you to visit. The place is touted as one of the most important ancient burial and ceremonial sites in Canada. The Kay-Nah-Chi-Wah-Nung Historical Center has a network of 15 burial mounds that measure up to 40 feet in height, and 20 archaeological sites that can surely amaze you. Also known as the “place of the long rapids,” the Ojibway people consider the site as a sacred place. The Kay-Nah-Chi-Wah-Nung Historical Center lies along the north bank of Rainy River in the western side of Fort Frances. If you worry for a place to stay the night, you can find several Hotel accommodations in Fort Frances for that purpose. There’s a section in the city of Montreal that’s popular for its old and picturesque historic buildings. The Old Montreal boast of its cobbled streets where you can find old-fashioned horse-drawn carriages and lovely open squares. Yes, the city of Montreal has features of a bustling modern city, but this part of Montreal is the favorite place for most tourists who are looking for a different kind of experience. Some of the instagrammable sites in Old Montreal include the Place Jacques-Cartier, Rue Bonsecours, the Notre-Dame Basilica, and the Marché Bonsecours. Astonishing giant limestone monoliths rising out of the sea will welcome you if you visit Mingan Islands in the eastern part of St. Lawrence Lowlands. According to experts, the limestone monoliths are already around 450 million years old, sculpted by waves, winds, changing sea levels, and Canada’s freezing temperature. Known as the first national park in Canada, the Banff National Park is also the country’s largest and most visited. A lot of tourists visit the park annually because of its beautiful scenery and diverse wildlife. You can find in Banff National Park a wide range of animals like bison, wolves, bighorn sheep, grizzly bears, black bears, bald eagles, and moose. There are also different luxuries like spas, restaurants, and five-star hotels that you can experience not far away from the park. Niagara Falls is one of the most famous natural attractions in Canada that draws in millions of tourists every year. With just an hour’s drive from the city of Toronto, you can already witness the majestic falls that drop at roughly 57 meters or 188 feet. The Niagara Falls consists of three waterfalls, namely: the American Falls, Horseshoe Falls, and Bridal Veil Falls. If you want to witness the majesty of the Niagara Falls, you should make sure that you visit it during the summer months of June to August. During this time of the year, you can benefit more from your trip because of the weather and the various accommodations. Canada is a beautiful place to visit for your next travel vacation. It has a lot to offer from beautiful natural attractions to lovely landmarks and historical sites. If you want to visit Canada and don’t know where to spend the most fun and satisfying experience in this country, you can go to the places mentioned above for that purpose.